People’ Democracy March; Civil Rights Campaign. 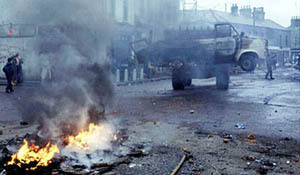 There were riots in the Shankill Road area of Belfast. The Irish Republican Army (IRA) placed a large time bomb at the Woodford waterworks pumping station in North London. Three people were injured in the explosion and there was substantial damage. The Irish Republican Army (IRA) truce was officially brought to an end. Two members of the Ulster Defence Association (UDA), a father and son, were shot dead in their home by other UDA members in an internal dispute. Fifteen Westminster by-elections were held across Northern Ireland. The by-elections were caused when Unionist Members of Parliament (MPs) resigned their seats in protest at the Anglo-Irish Agreement (AIA). Unionists fought the election under the slogan ‘Ulster Says No’ and wanted the elections to act as a referendum on the AIA. The SDLP decided not to nominate candidates in safe Unionists seats but instead fought in four marginal constituencies. 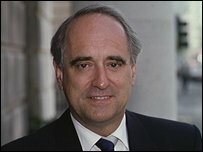 Brian Mawhinney, then Member of Parliament (MP) for Peterborough, was appointed as a junior minister at the Northern Ireland Office (NIO). Mawhinney was originally from Northern Ireland. The Irish Republican Army (IRA) issued a statement that it had “stood down and disarmed” its West Fermanagh Brigade. This action followed the killing (on 15 January 1989) of a man whom, it was claimed, was an Royal Ulster Constabulary (RUC) informer. Michael Ferguson (21), a Royal Ulster Constabulary (RUC) officer, was shot dead by the Irish Republican Army (IRA) on Shipquay Street, Derry. 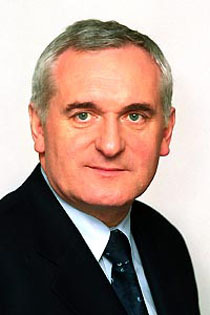 Albert Reynolds, then Taoiseach (Irish Prime Minister), said he would give clarification of the Downing Street Declaration (DSD) to anyone who asked for it. Martin McGuinness, the Vice-President of Sinn Féin (SF), described it as an affront. A number of parties and individuals called for the Ulster Democratic Party (UDP), which is politically associated with the UDA / UFF, to be expelled from the multi-party talks at Stormont. The UDP issued a short statement in response to these calls. Liam Conway (39), a Catholic civilian, was shot dead by a Loyalist Volunteer Force (LVF) gunman in Hesketh Road, in north Belfast. The shooting occurred around 5.00pm a few hours after the UFF had announced the reinstatement of its ceasefire. Conway was working on laying gas pipes in a Loyalist area. Liam Conway worked to help support his sister and two blind brothers. A man was shot and injured in the legs in a Loyalist paramilitary ‘punishment’ attack. The Royal Ulster Constabulary (RUC) arrested a 13 Protestant men in various parts of Belfast. Four of the men were from Portadown and were believed to have links with the LVF. The RUC also discovered a cache of Powergel, a powerful commercial explosive, together with other explosives in a house in the Shankill area of Belfast. 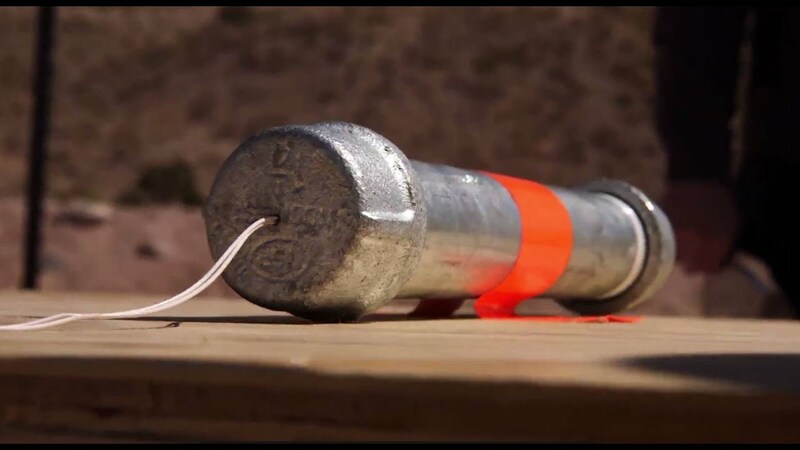 An estimated 300 pounds of explosive were recovered. Bertie Ahern, then Taoiseach (Irish Prime Minister), laid a wreath at the ‘Bloody Sunday’ memorial in the Bogside during a visit to Derry. He called for a full independent inquiry into the events of ‘Bloody Sunday’. He also visited Belfast where he stated that there would be no “internal solution” to the problems of Northern Ireland and that any North-South bodies would have to have executive powers. Loyalist paramilitaries carried out two ‘pipe bomb’ attacks on the homes of Catholic families living in Larne, County Antrim. The Royal Ulster Constabulary (RUC) announced that seven police bases along the County Fermanagh border would be closed in the coming weeks. A 70 year old man carried a pipe-bomb out of his home in Garvagh, County Derry, after it was thrown through a window and landed at his feet about 1.00am. Not realising what it was, he lifted it and took it outside. His 60 year old neighbour, who lives alone, had been asleep when a similar device was hurled through her window. The householders, both Protestant, said they had no idea why their homes had been targeted. The attacks were not thought to have been sectarian. 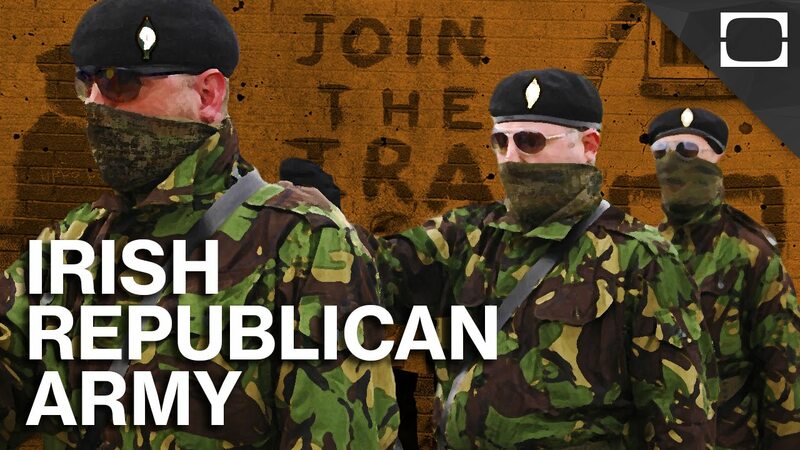 Republican Mortar Attack There was a mortar attack on a British Army base in Derry. Dissident Republican Paramilitaries were believed to have been responsible for the attack. Tony Blair, then British Prime Minister, held meetings with the pro-Agreement political parties to try to break the impasse over the remaining issues of police reform, demilitarisation, and paramilitary disarmament. 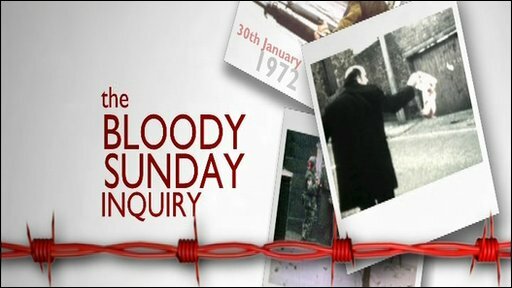 The Bloody Sunday Inquiry announced that it would temporarily move to a location in Britain in order to hear the testimony of British Army paratroopers who fired the fatal shots in Derry on Bloody Sunday (30 January 1972). The 36 soldiers had won court cases that supported their wish not to have to travel to Derry to give evidence. Shot with his son at their home, Rosebery Gardens, off Woodstock Road, Belfast. Internal Ulster Defence Association dispute. Shot with his father at their home, Rosebery Gardens, off Woodstock Road, Belfast. Internal Ulster Defence Association dispute. Shot, while sitting in mechanical digger, laying pipes, Hesketh Road, off Crumlin Road, Belfast.